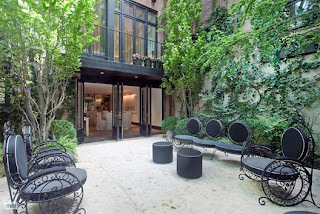 I received this posting today from Curbed NY- this gorgeous townhouse just hit the market and could be yours for a lonely sum of twenty million plus. 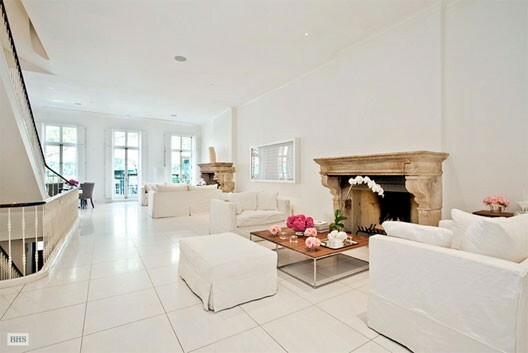 Big price tag but this townhouse is truly beautiful- not a detail overlooked. 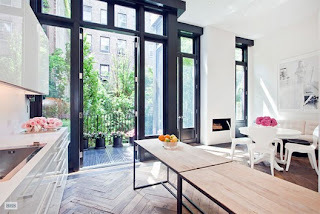 I love how the white walls & wood herringbone floors contrast with the heavy steel windows and doors painted a navy black. 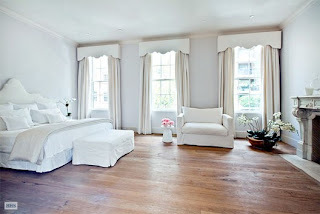 I also love the clean chairs against the warm floor- inviting, modern and clean. These valances are so yummy- keeping the fabric the same throughout the room keeps it calming and sophisticated while the added detail in the shape of the valance adds whimsy. I also love the large wooden bowl filled with orchids tucked in the corner. These reclaimed fireplace hearths are the focal point and without them... the white scheme may be too sterile but these warm up the room...literally. Well done. Thanks Curbed NY for sharing and keeping us in the loop!